The Viano 25L Spreader is a strong and robust push spreader for the home user who wants a quality spreader that will LAST. The hopper has a large 25L capacity and will spread fertiliser some 3-3.5 metres enabling you to cover large areas with minimal fuss. 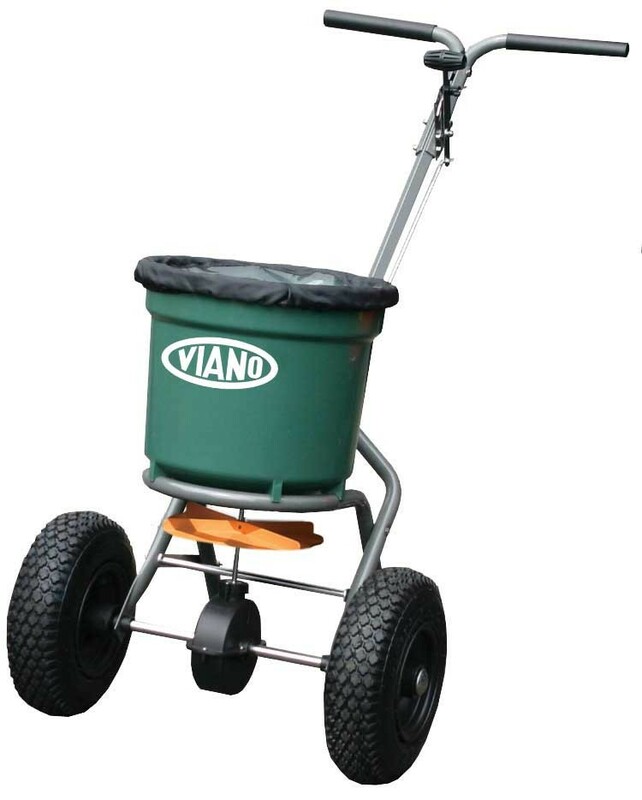 The Viano 25L Spreader is the ideal push spreader for the home user. The hopper has a large 25L capacity and will spread fertiliser some 3-3.5 metres enabling you to cover large areas with minimal fuss. The fingertip cable control allows you to command what and how much you are spreading and the T shape handle makes it very comfortable to use. Large 30cm diameter pneumatic wheels make this spreader easy to steer and push over garden terrain. The hopper is manufactured from black heavy-duty poly with a rugged steel frame. This machine will last you years and years. Viano centrifugal spreaders can be used for spreading Regular Crumb (RC) or Micro Crumb (MC) fertiliser. This spreader cannot be used to spread powders. Important : - the maximum opening of the Viano spreader is at number 10 on the settings scale .